At this point in my career, my bag of optical sayings is overflowing. One of my all time favorites is this. “In optics you always give up something to get something.” For example, if you want great optics you will wear glass and suffer the weight. If you want the thinnest lens available you will wear 1.74 and suffer the aberration. If you want to wear those super chic, big sunglasses you will suffer with weight and edge thickness. Before we go any further you need to know that a lens blank is not the same as a lens. In free form, a lens blank is to a lens, what a canvas is to a painting. The blank is the base for the application of design or art. In this case the Camber series lens blanks are (add appropriate here). Then the design software and generators take over and create the back surface design that produces a top-tier, free form progressive like Integrity. After years of writing for optical industry publications, I am a pretty harsh critic of articles, ads and product brochures. It is not often I give praise, however Younger’s Camber lens brochure is a true stand out! Creative, beautiful, eye-catching and informative, the brochure does a great job of introducing the art and science behind their lens blank series. Although I give well deserved praise on the Camber brochure, I do take issue with its opening statement, “Almost every ECP is familiar with the Tscherning Ellipse below, which indicates the two lens base curves that are optically ideal for each dioptric power.” I must admit I consider myself pretty well schooled in basic optics, but I was not “familiar” with Tscherning’s Ellipse. I am familiar with Vogel’s Rule which states that we are always in search of the perfect base curve – Rx match. 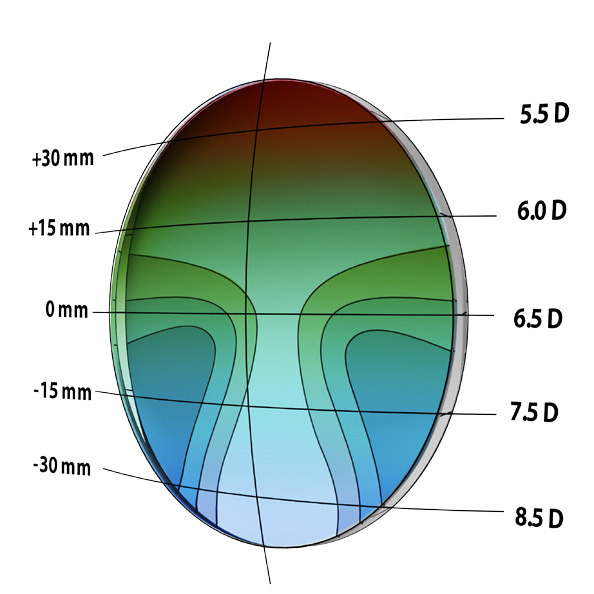 Both of the concepts, Tscherning’s and Vogel’s, remind us of the importance of base curve consideration in lens design. There is a dichotomy here. On one hand, Younger was starting something new and highly technical. On the other hand, it all comes from one of the most basic concepts in optics - base curves. The key to the Camber lens blank series is variable base curve technology. By their returning to the basics they were able to create a lens series with a highly technical design. This lens design features unparalleled optics and advantages over other progressive lens designs. David points out, “Younger, the world’s largest independently owned supplier of lens blanks, in partnership with Indizen Optical Technologies (IOT), have designed the Camber lens blank series to finally allow the proper synergy between the front and back surfaces of a progressive lens.” Based on our history of working with Younger and IOT, Laramy-K Optical Lab was one of the very first labs to be offered this new lens blank. We have found that in particular hyperopes and those in need of larger intermediates and reading zones benefit greatly from the Camber design. Our customer feedback has been excellent. 1) A blank with a fixed, single curve. These are generally a lens blank designed for a single vision Rx, yet are being used for a progressive. These two designs are a holdover from when free-form processing was first introduced. It was quickly discovered that by greatly reducing lens stock or SKUs, a lab could save both a considerable amount of money and storage space. This also meant that lens processing was being dictated more by economics than by optics. This, as we well know, does not always produce the best lenses and makes Janet’s head explode. Both of these designs take us back to my initial point. They rely on compromise in one area or another and also violate the basic base curve rules of optics. Another one of my favorite optical sayings is this, “The shorter the radius, the steeper the curve - the steeper the curve, the higher the power - the higher the power, the thicker the lens (in a given material). It was chant I had my students memorize and recite. Grab a Camber brochure and take a look at Figure 6.1 The Elephant’s Trunk Curve. It took me a moment to let it sink in. But once it did, there it was! My favorite optical saying, presented in a very cool graphic form. On page 11 of the brochure, a highlight is, “easier frame selection because higher base curve prescriptions have fewer frame limitations.” I asked David to explain that. The Camber lens series is currently available in hard resin, polycarbonate, Trilogy – Trivex, 1.60 and 1.67. Clear, NuPolar polarized and Transitions Signature VII are available. Laramy-K processes the series on its Schneider Sprint Line 2 generators, of course running IOT software. If you take a few moments to read through the entire Camber brochure, and get to page 10, you will notice a rather shocking bit of information. Look at the chart “Hierarchy of Importance.” Isn’t it refreshing to see the ECP on top for a change? Isn’t it nice that after years of tormenting free-form language play and technological jargon, you see that you are still the most important piece in the puzzle! Sometimes to move ahead, we first need to take a step back and reexamine the basics before taking another step forward. A big thank you goes out to Younger and to David for bringing our attention back to the importance of base curves and to the importance of ECPs too! It was a pleasure to speak with him and it is always energizing to hear true passion about the importance of what we do. Call us with any questions you have about trying Camber technology for your customers.